We arrived by train at Cheshunt station, a long stone’s throw from the Youth Hostel. It took quite a bit longer than the flight of a stone to get there though, as nobby required fifteen minutes to reassemble his Dahon – much of it to do with mounting the Brompton bag on the rack – and we also had to wait at the level crossing for the Stantsted Express to pass. The blurb on the YHA site describes the hostel thus… “Close to London, these six log cabins are situated on the shore of a lake in the 10,000 acres of Lee Valley Country Park. There are plenty of activities on offer nearby – take your pick from sailing, kayaking, caving, climbing and canoeing to name but a few.” And one of the activities not named – cycling. Once there, at about 2pm, we were both too tired from the journey to go exploring so we checked in and put the bikes in the Cycle Store. The entrance, the carpark, the walkways, are all gravel. Possibly my least favourite surface, and usually hard work for wheels, the problem is alleviated here by laying the gravel on a substantial plastic mesh with a 2 inch square grid pattern. It could still do with raking down where there isn’t too much traffic, like in the cycle store, but it’s bearable. The cabins themselves are scandinavian in design, built on two levels, the lower having disabled access with disabled toilets and also incorporating a lounge and self-catering area. There’s a strong eco theme to the development, the cabins have underfloor heating, the energy for which is pumped over from the lake. It takes a long time to adjust the temperature in these systems – in the order of a day – and we ended up sleeping with the window open to regulate the temperature in the room. Cabins 4 and 5 in the distance have bathrooms designed for wheelchair users, although we didn’t actually see these. We got a real coffee and biscuits at reception, perused the Cycle Touring mags and the Lee Valley Park maps in the library, had an evening meal in the canteen, and finished with a bottle of Black Sheep. If you’re not feeling that adventurous everything you need is there on the premises. The following day we were up early for breakfast and discussed the cycle route back into London with Lorna on reception. She had followed the Cycle Path all the way to Limehouse on the Thames so we should have no trouble finding our way back into the city. We headed north first, looking for a cafe in Broxbourne. 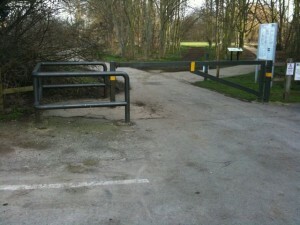 Leaving the Youth Hostel and entering the park we encountered the first barrier. A recumbent trike would go under this gate without a problem, but an upright one would need to be manhandled over or around the side. We came across a variety of gates and barriers, all we believe negotiable on a trike with a little monoeuvring backwards and forwards. Not ideal, but all too common. 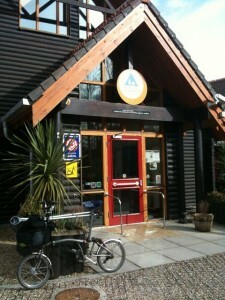 There was no cafe at Broxbourne, but refreshments are available there at weekends and at warmer times of the year. Although the sun was shining it was pretty cold by the river and there weren’t too many people about on a Thursday morning. We followed the river path, via the Riverside Cafe in Waltham Abbey ,all the way down to Tottenham Hale station where I needed some help from a guard to get my bike across to the southbound platform. From Liverpool Street we completed our journey around the Circle Line to Paddington and then home. See discussion on bookings etc on the google group. 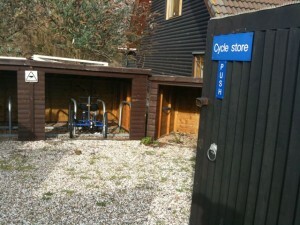 This entry was posted in Inclusive Cycling Forum and tagged bikes, london, words, yha on Sun 7 Mar 2010 by kevin hickman.